How should we pray in the midst of devastation? As a nation we have watched two major, devastating storms hit our land causing destruction, fear, anxiety, death and loss beyond comprehension. How are we to pray? I think Job gives us a clue when he said, “Though He slay me, yet will I trust Him.” Brennan Manning once wrote that God would rather hear us tell Him we trust him than we love Him. He wants us to trust in His love and care. 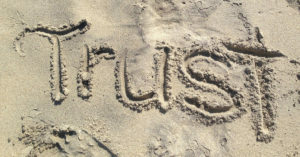 Trust is evidence of our love for Him and an understanding of His character. I believe those kinds of prayers in the midst of loss, pain and suffering bring joy to the heart of God. When we affirm our trust in Him and our dependence on Him, not our circumstances, we are drilling down to the bedrock of His almighty character. I know the days, weeks, months, years of rebuilding will test every fiber of our society. For now adrenaline carries the day…but weariness will set in. A good look at the situation will overwhelm us. We have to keep our focus on God. He is still on His throne. If He is in control why didn’t He stop it or lessen the storm? We live in a fallen world. Bad things happen. Horrible things happen. But none of these things can separate us from His love. “Shall tribulation, or distress, or persecution, or famine, or nakedness, or peril or sword…I am convinced that neither death, nor life, nor angels, nor principalities, nor things present, nor things to come, nor powers, nor height, nor depth, nor any other created thing shall be able to separate us from the love of God, which is in Christ Jesus our Lord.” That is security, folks! True security. http://www.ruthgraham.com/wp-content/uploads/2017/09/trust.jpg 628 1200 Michelle Fitzgerald http://ruthgraham.com/wp-content/uploads/2016/12/ruth-graham-logo.png Michelle Fitzgerald2017-09-11 19:55:002017-10-20 20:39:02How should we pray in the midst of devastation? Thank you for this, I will focus on trusting Him. I will keep my focus on him! I just heard Ruth Graham today at the Joyce Meyer Ministry conference in St. Louis. After hearing her talk about the prodigal son, I know I can never, ever be the same in my relationship with the Lord. I know now that I could never backslide as mentioned in Isaiah chapters 60-66. And now I am confident in knowing, I can no longer have any idols in front of me that could hinder me from hearing Him. Thank you Ruth Graham. Your sharing of hurt and discouragement touched many lives today. I enjoyed every word you spoke at the love life 35 Joyce Meyer conference. Thank you! This weekend when you spoke at Joyce Meyer conference you said to turn to your blog to find out your whole testimony. I was unable to find that. What am I doing wrong. We are in the process of uploading the podcast. Please check back in a couple of days. Thanks. Thankyou Ruth for sharing your testimony at the Joyce Meyer conference. This hit home for me. I just started reading your book “In every pew sits a broken heart: Hope for the hurting”. Your teaching at love life 35 was the word I needed to hear “self righteousness”. I had never heard anyone talk about the brother of the prodigal son🙂🙂. There’s no more shame and condemnation in Jesus Christ. Lord teach me how to lay it down on you feet and I completely trust you. Racism Is this the end?